If your client requests a change order, you can revert to a prior version or make the necessary changes manually. Option 1: Reverting to a prior version of the Proposal. If your client requests a change to revert back to a previous version of your proposal, you can go to the Proposal History section and select "Revert" on the version you'd like to restore. Select 'OK', and you're done! Review and resubmit to your client. This would typically happen before the proposal has been accepted. 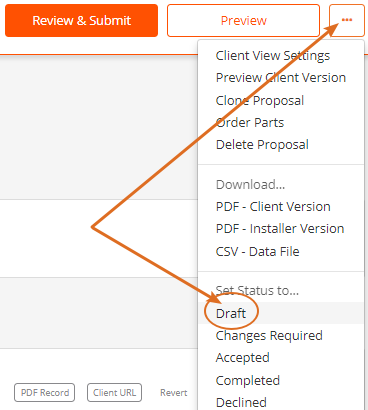 Move the Accepted proposal into Draft status by selecting the Options icon in the top-right corner (looks like '...') and then selecting "Draft" under "Set status to..."
2. Add the item(s) you want to remove to the room(s) you are removing them from, but with negative quantities. This allows your client to see that they were removed, and the prices cancel out the original item. You can drag the new item in the room (with the negative quantity) to be directly underneath the original item. 3. Add the replacement item to the proposal like you normally would. 4. Once finished, resubmit to the client for approval. Some dealers also note the CO# in the Project Description and/or Room description. You also can note the payment for the change order as a separate line item in the Payment Schedule.